At the touch of a button, a discarded shipping container transforms into a restaurant in under 2 minutes, right before your eyes. This incredible and intriguing creation is called MUVBOX, and has become somewhat of a sensation in Old Montreal, and even across the globe. Inspired by Illy Cafe’s Push Button House, restauranteur and entrepreneur Daniel Noiseux designed the MUVBOX concept to create ‘fun experiences worth sharing with others’, and many would say that he has been successful in this. With a background in architecture and graphic design, Noisex understands functionality and aesthetics, and says he has a penchant for marrying design sensibilities with high quality food service. He loves to use objects differently from theiroriginal intention, and says that functionality is critical. 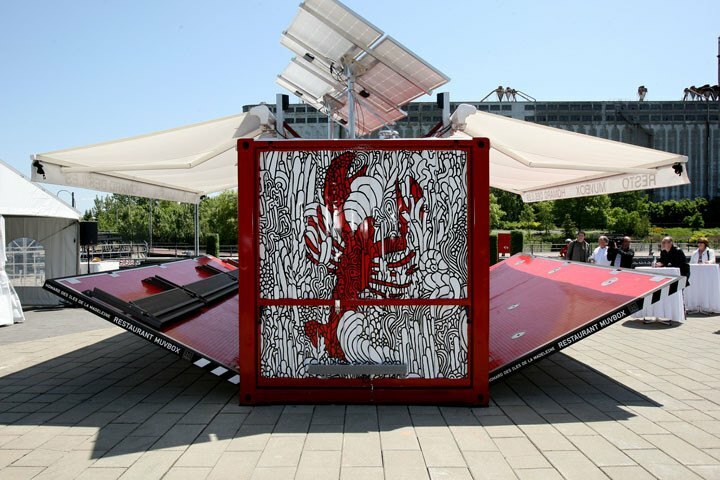 The MUVBOX mission is to create a network of unique mobile concepts based on the slickly designed recycled steel container. The proposition is straightforward: Keep it simple, trendy and eco-friendly, and MOVBOX achieves this in a number of ways. 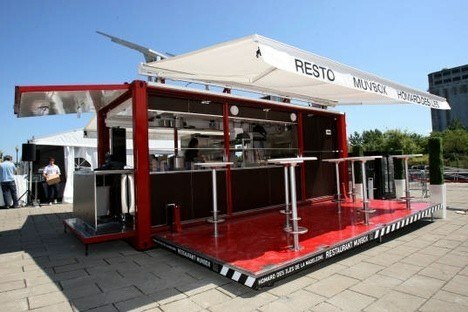 The portable restaurant is constructed from a 10 or 20 foot shipping container and is customised according to clients’ specifications. MUVBOX offers a full spectrum of services from conception and fabrication to shipping and the logistics of installation onsite, anywhere in the world. Eco-friendly options for materials are used in construction and solar panels provide enough energy for the interior lighting and the opening and closing of the box. All of the food packaging including napkins, trays and cups are made from recycled paper, and the utensils are made from biodegradable plastic. With each MUVBOX generation, Noiseux believes that the MUVBOX can continue to implement eco-responsible materials and evolve the box to the point where it has no imprint on the environment at all. The MUVBOX is constructed from a recycled international maritime shipping container which makes the box easily transported by land or sea. A basic MUVBOX unit takes approximately six weeks to produce, but can take longer depending on quantities ordered and custom finishing. As it is not permanently set on the ground, there is no need for building permits, and it can be placed anywhere with relative ease. If you would like more information on how shipping containers can be modified to suit your needs and circumstances, or would like to enquire into shipping containers for sale or hire, call Premier Box Shipping Containers on 07 3888 3011, or Get a Quote Online.